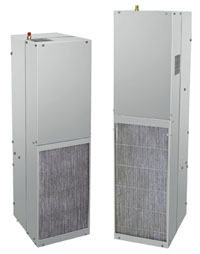 The Hazardous Location Series offers capacities up to 24,000 BTU/H in single and 3-phase power. Many features such as a programmable thermostat, compressor short cycling protector and Hi/Lo temperature alarm are standard. These units are offered at a lower cost and are easily maintained when compared to traditionally designed hazardous location units. Typical applications include oil refineries, paint and varnish manufacturing plants, petrochemical sites and hazardous materials storage sites. These stainless steel units are used where hazardous gases may be present, and are also suitable for corrosive environments. All Hazardous Location Series models are UL/CUL Listed. The Hazardous Location Series Air Conditioners Maintain NEMA Type 12, 3R & 4/4X Enclosure Ratings. All Hazardous Location Series models are equipped with a programmable thermostat, allowing more accurate and versatile performance features. All Hazardous Location Series units have a programmable temperature alarm to alert if early action is required. Hazardous Location Series models are designed to withstand shock and vibration in two different planes for a minimum of 4 hours per plane at 1G acceleration. R410a, an HFC having zero ozone depleting potential, is used in all Hazardous Location Series Air Conditioners.